Kate The Bake: what to do with the windfalls? I was gazing out of the window at home, looking into our next door neighbour's garden. This is a care home and though the patio is lovely, the main garden is just laid to lawn which lays all summer yearning for someone to walk, laze or play football on it. There are 2 mature apple trees on the western side, laden with fruit, it looks like a bumper crop. Last year I watched them fall to the ground and rot slowly into the long grass around the trunks. This year I am going to ask if they will let me collect some of the windfalls to bake and preserve. I remember as a child being sent out to pick up windfall apples. We lived in a suburb to the north of London. Houses and gardens were fairly uniform in size all around us, but our garden snaked up longer than every one else's then wound down the back of 4 or 5 houses. It was difficult not to be nosey as you wandered past everyone else's garden, peering over the fences and beyond the compost heaps at the end of their gardens. To run to the end of the garden and back was 800m. Unsuprisingly that proved to be my best distance at school, but long before that I would creep up the garden on early autumnal evenings following instructions to collect windfalls from the old bramley the right behind number 102 or from my favourite trees - the 2 coxes behind number 100. The timing was critical. Too early after school and the wasps would still be busily gorging themselves on fallen feasts. I happily admit I am no friend of wasps - not since one crawled between my fingers and my violin neck and stung me in orchestra practice. I tried to be cool but lost it completely after 2 stings (I wasn't tough - I was nine!) and burst into tears. Ever since then, I have tried to keep my distance from wasps. Anyway, when the shadows were looming and the wasps disappeared in their drunken late night stupor, it was my job to dash up the garden to the ancient 'apple store'where the garden tools lived. Reaching in through the door at floor level (don't open the door, it creaks and squeals) my hand would flap around till I felt the plastic edge of a dusty trug. Ease it out of the door without stepping foot inside or knocking any leant-up tools over and run on down the back straight of the garden to reach the particular tree. The reason for the stealth was simple. Our garden was built on an Elizabethan (Elizabeth the 1st, not the 2nd) kitchen garden and the tall brick wall which formed the southern boundary of the garden was haunted. Yes really. My older brother swore it was, he'd seen a ghost - a knight in shining armour that clanked and dragged a chain. Believe me, at that age, even the slightest hint that the story may be true was enough to set my overactive imagination into hyperdrive. The ghost might linger in the apple store till it was dark enough to roam free so don't open the door and disturb him. Carrying the trug (a classy 1970s khaki plastic number that bruised and grazed your knees as you bumped it against your legs) I bolted up to the end of the garden and eased myself past the 3rd and biggest compost heap to the old cox tree on the right hand side. I think if you saw these trees in winter you would never imagine the beauty of the fruit they produced. Two knarled branches forked from a low trunk - maybe only 3 foot high. The branches reached out like ancient out-stretched arms offering a slightly scary hug. There were no more branches or even twigs for another 4 foot or so on either branch save a small leaf cluster part way up. At the end of either branch there was another fork then a cluster of weak and almost bare twigs. When I was a little girl the autumn crop would be 15 maybe 20 small apples in a good year, but by the time I was grown up this crop had reduced to 3 or 4 (these trees were really in the autumn of their life). 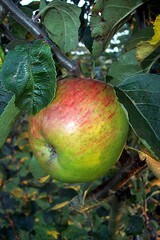 A pale yellow hue to the skin with faint pink or red stripes running vertically the apples. The tree on the left produced more fruit but not so stripey. The gnarled old tree on the right, though, produced these few amazing fruit. You could smell the fruit on the ground, a rich scent, a touch of alcohol from the older fruit missed and rotting on the ground and mingling with the smokey hues from the autumnal bonfires and the odd end of season barbecue. The day's windfalls would be tucked into the long grass around the tree. You couldn't really see the apples but there would be a gap in the grass tops were the apple had fallen - you could reach into the hollow and grasp the little apple deep inside. There wouldn't be more than 5 or 6 at a time, sometimes none at all but you had to crawl round the whole tree and sweep the ground maybe a metre and a half from the trunk, smoothing down the grass to check no treasures lay hidden beneath the surface. Gathering the few apples into the trug along with a few bramleys if I happened to stand on them as I passed, I would shoot back down the garden attracted to the light at the back door like a clumsy moth. Without care, the apples would bounce and tumble from the shallow trug as I ran but on a good day I would arrive intact, briefly dazzled by the bright electric lights. A pause in the kitchen to off load my spoils, a quick dip into the biscuit barrel for one last home made biscuit and off with a book to bed. By morning, the kitchen would be clean and tidy but the apples would be gone. Dad would check over the apples. Bruised eaters couldn't be stored so would be kept, or more likely swapped with neighbours or friends. The prize though, went to the perfect apples. Unbruised, without any knicks or cracks to the waxy skin, these apples would be carefully wrapped in wax paper and stored in ancient wooden trays in the apple store till Christmas. Bramleys may be stewed and frozen but Dad's favourite recipe was for apple cheese. He would hold onto bramleys until the jam pan could be filled, then chop and trim the apples, into the pot they would go, core and all. Boil them down then through the pureeing sieve on mum's old kenwood mixer. Back in the pan, add as much sugar as apples then boil gently and stir, stir, stir. When the mixture was thick and bubbling like porridge, stir in a little fresh apple juice then decant into warmed sterilised old jars. Topped with circles of waxed paper and lidded, this was our standard breakfast spread. "That'll put hairs on your chest" said Dad (almost every timethe jar left the cupboard). Thankfully, I can report, it doesn't! I love this recipe, it requires so little prep and lots of cider! Do take care when you are reducing the sweetened puree, the mixture really holds the heat and can hurt lots if you get spattered on bare skin. 2 sterilised jam jars (around 300ml) with sterilised lids, oiled after sterilising. 2 wax paper discs, cut to fit just inside the neck of the jar. Using a non-corrosive pan (not aluminium or uncoated iron – enamelled casseroles are fine), boil the cider with the cinnamon stick until the cider has reduced by 1/3. Whilst this is happening, you can wash & trim the apples. Once the cider has reduced, put the apples (yes even the pips and cores) and simmer until the apples are mushy – this should take about 1 ½ hrs. Remove the cinnamon. Push the apple pulp through a fine sieve or mouli and weigh the puree you produce. For every 500g puree add 350g sugar (or slightly less if the apples are sweet). Heat the puree and sugar in a pan and stir until the sugar is dissolved. Then, put on a long sleeved top, cover your knees & your feet and turn up the heat! Bring the mixture to the boil and stir, and stir for around 25 minutes. You want to make a puree so thick that you can see the clean bottom of the pan as you stir. Don’t forget that this mixture will spit and pop so really do protect your bare skin (I totally speak from experience!). When the puree is ready, ladle (or decant with a jug) into the prepared jars, lay the waxed paper over the surface of the apple puree (waxed side down) and seal the jars with the lids and label them. This should store for up to one year. I'm dreaming of eating... apple cheese on gluten free waffles with vanilla ice cream.